PolyTalk 2018, held in St Julian’s (Malta) at the centre of the Mediterranean Sea, continued establishing and building new partnerships with stakeholders to prevent marine litter around the world. Representatives from international organisations, government officials, representatives from national environment ministries, NGOs, the plastics industry as well as the research community joined the debate and shared solutions from around the world to build bridges and new forms of collaboration throughout the Mediterranean area. CLAIM’s Co-coordinator Dr. Nikoleta Bellou, HCMR, together with WP3 leader Marco Faimali, ISMAR-CNR, took part in a panel dedicated to “Improving Resource Efficiency and Accelerating Innovation to Increase Circularity – Innovation”. 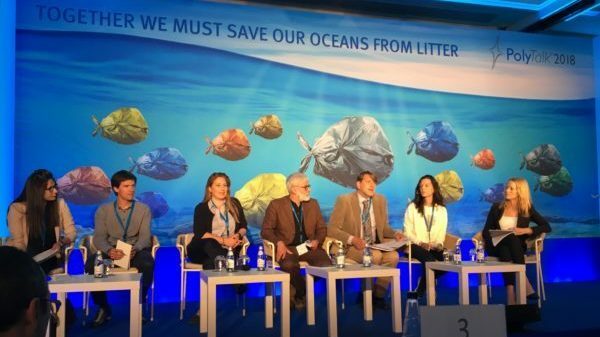 The panel discussed hot topics in marine science, including microplastics, plastic leakage and new solutions and technologies to tackle these issues.